There are various ways to water your lawn. Are they all good ways? The most important thing is not to over water your lawn. I would generally say a lawn needs anywhere from 1 to 1 1/2 inches of water per week. This includes what mother nature might drop on it. To find out how many inches you are watering your lawn, you can set empty tuna cans out to measure how many inches and how long it takes to achieve the inches you want to put on your lawn. Do this while your sprinklers are going or even with rainfall. Click here to see a watering chart to assist you. Watering too often causes a couple of problems. One being that frequent shallow watering causes roots to grow short which will cause drought and other problems. Overwatering will feed the weeds and they love it when that happens. Another tip is that when you water your lawn, try to do it early in the day to keep it from evaporating from the sun. I will cover a few ways that are used to water a lawn and whether it if it is a good choice or not. This way you can decide for yourself which way you are going to water your lawn this summer. Hand Watering The Lawn – Many people will take a hose and nozzle to try and water their lawns. But how do you know if you have watered too much? That is the biggest problem doing it this way. 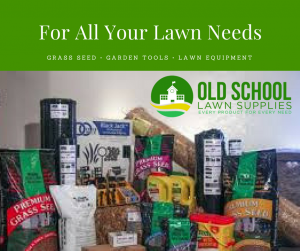 It works fine with flowers and plants but not so much so with lawns unless you are watering small patches where you planted grass seed. Sprinklers – This is the way most people water their lawns. There are different types of sprinklers to consider. Click here to see a selection of sprinklers in Old School Lawn Supplies. All of these are handy for large yards and they have their advantages and disadvantages. They are fine to use but pick the one that is going to work for you with respect to your size yard and how you want to distribute the water. Permanent Or Built-In Systems – This is probably the best way to water your lawn and the cost to have this type of watering system reflects that. You don’t have to worry about the bulky hose around the yard. It is by far the most efficient and convenient way. You just set the timer and the system does the rest for you. You incur a lot of cost with this system because you have to dig and run pipes and if you are in a cold State you have to have the system winterized annually if you want to keep it operating properly. Drip Irrigation – This method is not reasonable for doing lawns. this involves letting water ooze out of a hose soaking the root area of whatever is growing. This may be fine for plants and gardens but not for your lawn. I hope this post helped someone out on their summer lawn and garden this year. Look at the video below for more tips. Please don’t hesitate to leave any comments or questions below. Together we can make everyone’s yard beautiful and attractive. Hi! Great post. I guess there’s a lot of variances of how much water because it would depend on the climate you live in and what type of grass it is. Some variations are less thirsty! I live in Australia where it regularly tops out at 40 degrees celcius during summer and 15 degrees celsius in winter. Would you recommend the same watering for each season? Good point. I would say the water levels mentioned is pretty much safe for all types. The thing you want is not to over water in all conditions. When your lawn stays to wet it is deprived of oxygen and is open to diseases that thrive in the constantly wet grass which can ruin the health of the lawn. Some people make the mistake of thinking that it is 104 degrees so they should drown the lawn watering it. If you have extremely hot spots in your lawn you might want to spot water it but gauging how much to avoid over watering. I hope this helped you. You can sign up to receive my new post as I publish them. Thank you for visiting. I gotta admit I’m just an old school guy with a hose and nozzle. Hand watering is all I do. My lawn does get burned up so I only water in the early morning. I know it doesn’t get enough but in my case the condo corp owns it and not me. I just try. Great tips, Thanks for this. A lot of people water their lawn that way. I feel it is the owners choice on how they want to do it. Most likely your lawn stays burned because it doesn’t get that constant 1-1 1/2 inches it needs. You are getting some dry moments quite often sounds like. But I am glad you got some good information out of it and I hope your lawn starts to dodge the burning stage this year. Thanks for visiting and you are welcome anytime. Thanks for the post! A well looked after lawn looks great and glad to see you’re helping people achieve that! My pleasure. I try to post information so that maybe I might touch on something that someone may not be aware of. And you are right. You take care of your lawn it rewards the look of your home by standing strong and proud. Thanks for visiting Sean.